Returning for 2014... the Ale Trail is back, bigger and better than before. The format is the same, visit pubs, collect stickers and win prizes. 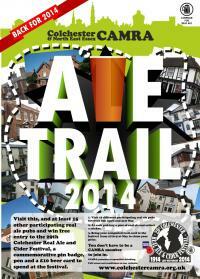 200 of you managed to complete the trail last year, can we beat that total? Collect a card at any of the pubs below from 6th April and collect a sticker for purchasing a pint of real ale (or real cider, where available). You must visit 16 different pubs, 8 from group A and 8 from group B.